Best Season: As summers in Bhuj tend to be harsh and rains can be torrential, the best time to visit Bhuj is during winters. Labels: Archaeology, Gravesite, Handicraft, Lake, Museum, Palace, Stepwell. Kutch has had four thousand years of inhabitation to build up a long and complex history, especially of its capital, Bhuj. The word kutch means island� in classical Sanskrit, referring to the fact that in antiquity, the Ranns (meaning deserts) of Kutch were submerged by the Indus River flowing into the sea, leaving the area isolated by an immense shallow body of water. In 1819 an earthquake changed the topography and the Indus began to flow further westward, leaving the Ranns (now separated into the Great Rann and Little Rann) as a vast desert of saline flats. During heavy rains, the Ranns still flood, leaving islands, known as beyts, such as Khadir. Some historians and archaeologists posit that the Harappans (also known as the Indus Valley Civilization) crossed the region by land, from the Indus River to the Sabarmati. Others doubt this, saying that the Ranns would have been permanently underwater at that time and crossing the deserts from Sindh would have to have been done further north. Either way, Harappan artifacts have been found in Khadir, making it one of the longest-inhabited regions of India. Bhuj is almost certainly mentioned in writings of two milennia ago; the writer Strabo (66 BC-24 AD) writes of Tejarashtra, whose principal city Tej is the modern-day Bhuj in all likelihood. From the 8th to 16th centuries, Kutch was ruled by the Samma Rajputs from Sindh, during what is considered to be Sindh's Golden Age. As the power center in Sindh declined, there was a series of complicated successions and intra-familial murders, leading eventually to the installment of Lakho Jadeja, descended from the Samma Rajputs, as king. From then on the monarchy was known as the Jadeja Rajputs, who ruled directly from Kutch, not from Sindh. In 1549 Khengarji I moved the capital from Anjar to Bhuj, given its strategic location in the center of Kutch. The name of the city was derived from Bhujiyo Dungar, the 160 m. hill that overlooks the city, and said to be the residence of the Great Serpent Bhujang, to whom a temple stands at the top of the hill. In the late 16th century, the area came under Mughal dominance, though the Rajput kings still held local administrative powers. King Bharmal I gained favor with the Mughal Emperor by sending many extravagant gifts, and when the Kutchi rulers granted free passage and hospitality to pilgrims bound for Mecca, the Mughals exempted them from paying tribute to the Emperor, and even allowed them to mint a local currency, the kori (which you can see examples of at the Kutch Museum.) At the beginning of the 18th century, Rao Godiji saw the need for Kutch to protect itself in the more volatile vacuum left behind by the decline of the Mughal Empire. He commisioned the building of immense fortifications for Bhuj, including 11 m. walls, and 51 guns around the edge of the city. 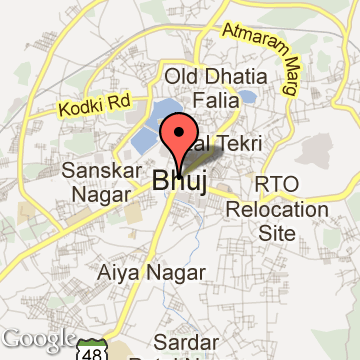 Bhuj Tourism - Get all information on Bhuj tourist places and sightseeing tours. Our website helps you plan your next tour and gives you great ideas on what to do, where to eat, where to stay and when to go there. We give the best information from the web to give you precise, meaningful and useful travel guide for leading places to visit in India and from across the world. Our travel information on BHUJ tourist places, tourist attractions, major sightseeing, the best time to visit, the top places to visit in Bhuj, the must-see things to see and do, maps, restaurants, hotels, nearby tourist destinations, local public information and more. To start with check out information on how to reach Bhuj.